The difficult conditions forced many of the riders into retirement in Florence this afternoon. Cyclists ride past the Santa Maria del Fiore Basilica in Florence today. TREACHEROUS CONDITIONS DUE due to heavy rain prompted several big name retirements before the halfway stage of the men’s elite race at the world road race cycling championships while Ireland’s representatives endured a disappointing afternoon. The four-man Irish team of Nicholas Roche, Dan Martin, Matt Brammeier and Sam Bennett all suffered crashes while three Grand Tour champions – Australian Cadel Evans, Britain’s Bradley Wiggins and American Chris Horner – were also among several riders to abandon prior to the halfway stage of the 272.2 km epic. And the victory hopes of the contenders still in the race were boosted by the later abandons of this year’s Tour de France champion Chris Froome, and Colombian climbing ace Nairo Quintana. 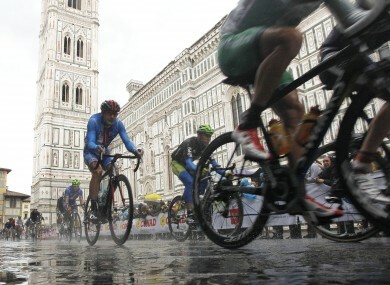 Heavy rain began in the early hours of the morning and despite a short respite it began to pour heavily on the 16.9 km course, to be raced 10 times, just as the peloton had arrived in Florence after a 103.2 km trek from Lucca. Evans, a former world champion and Tour de France winner, was one of several riders to come down near the barriers as the peloton chased down a five-man breakaway in the wet and slippery conditions. He was later reported to have abandoned by host broadcaster Rai Sport. The official organisers also announced the retirement of 2012 Tour de France yellow jersey champion Wiggins, part of the British team that was hoping to boost the victory hopes of outside bet Froome. Froome, however, pulled out with less than half of the 10 16.9 km laps completed as rain, thunder and cold temperatures continued to plague the race – and the British team in particular. With 90 km still to race Britain had only one remaining rider from their nine-man team, Welshman Geraint Thomas, still racing but the Team Sky all-rounder soon abandoned. Horner, who won his first Grand Tour at the Tour of Spain earlier this month to come into the race with hopes of a podium place, also abandoned the race. Belgium’s Philippe Gilbert is the defending rainbow jersey champion but faces a stiff challenge from several Italian riders, Slovakian Peter Sagan, Spaniard Alejandro Valverde and Swiss Fabian Cancellara. Email “Miserable day for the Irish as rain causes havoc at World Road Championships ”. Feedback on “Miserable day for the Irish as rain causes havoc at World Road Championships ”.